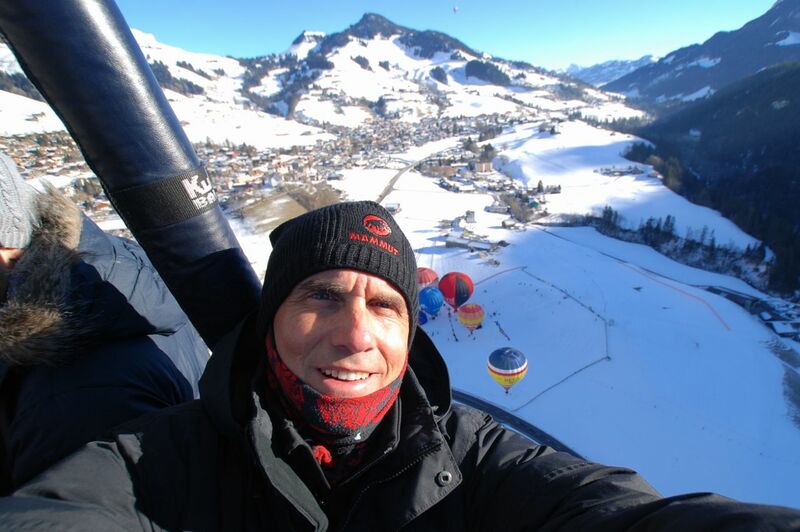 Last week I found a new way to enjoy the mountains here in Switzerland: floating 10,000 feet up in the air in a wicker basket held aloft by a sheet of nylon and a bunch of hot air. 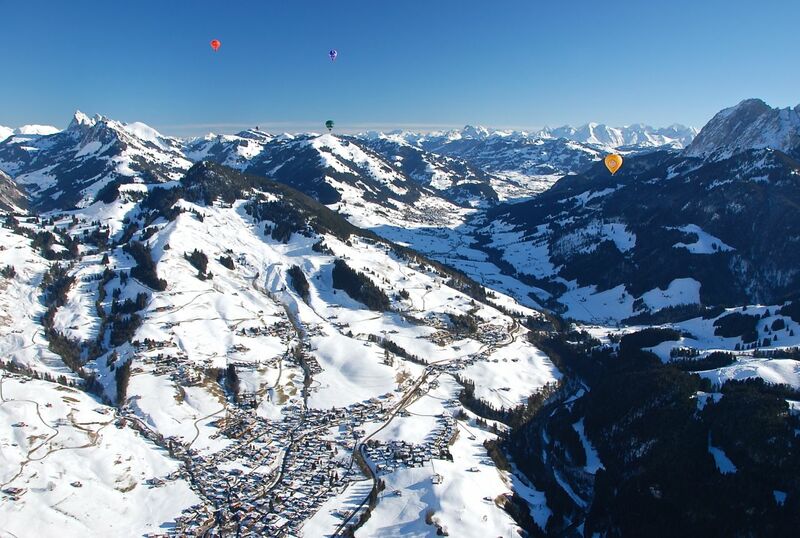 Yep, I went hot air ballooning in the Alps! Every January since 1979, the village of Chateau d’Oex (pop. 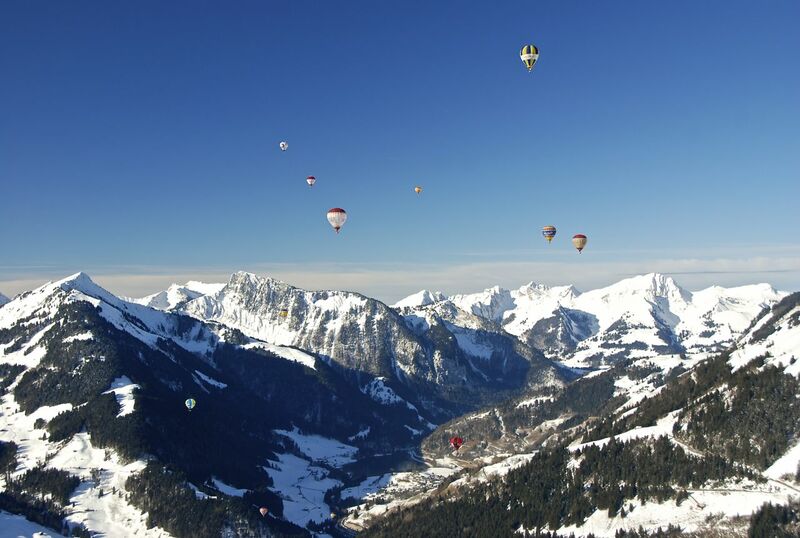 3,000), situated in the Swiss Pre-Alps east of Fribourg, has hosted the Festival International de Ballons. 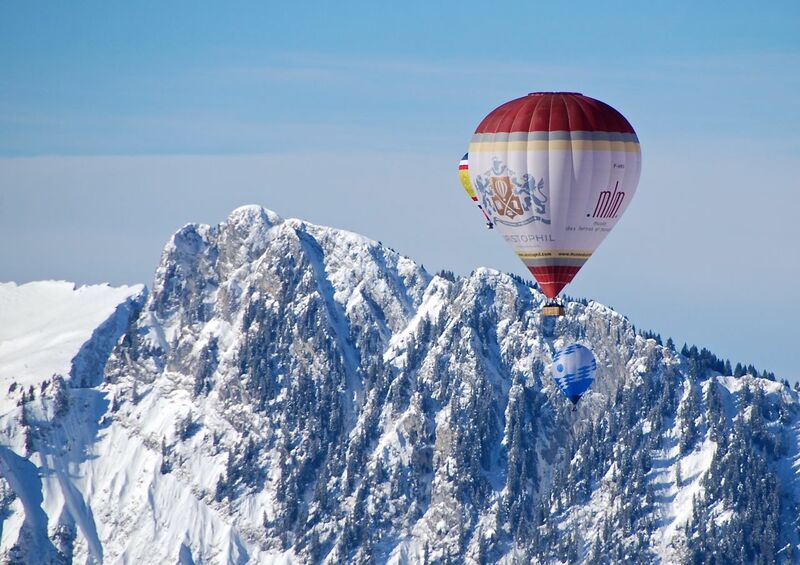 Thanks to the area’s spectacular setting and favourable flying weather, the festival has become a magnet for the world’s top balloon pilots and enthusiasts. 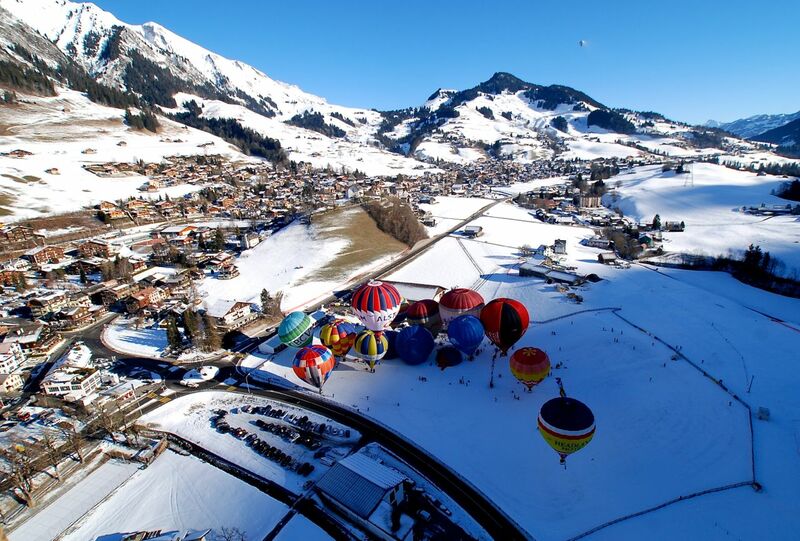 In fact, the village was the launch site for the first hot-air balloon, Breitling Orbiter 3, to circumnavigate the globe, back in 1999. 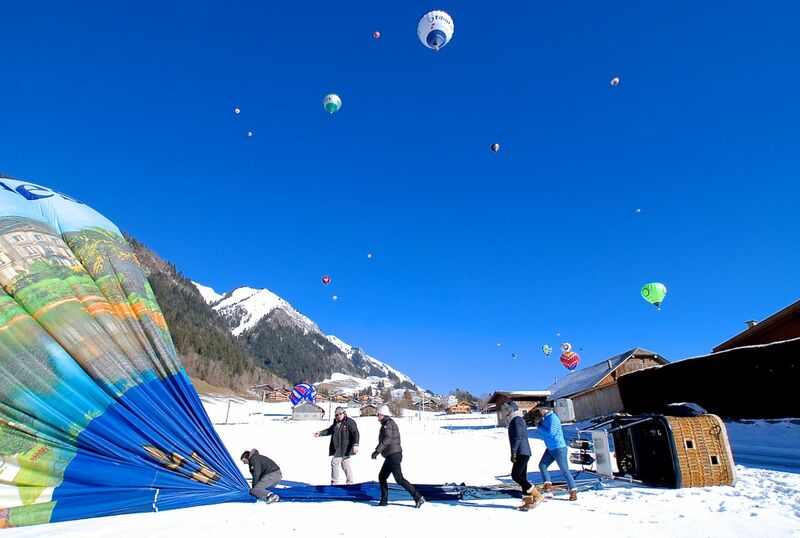 The festival features daily balloon flights starting from the village, along with demonstration events by sky-divers and para-gliders. Each day spectators can witness the launch of dozens of hot-air balloons, provided the weather and wind conditions are favourable (which they usually are at this time of year). Balloon launch zone: a little noisy and intimidating. 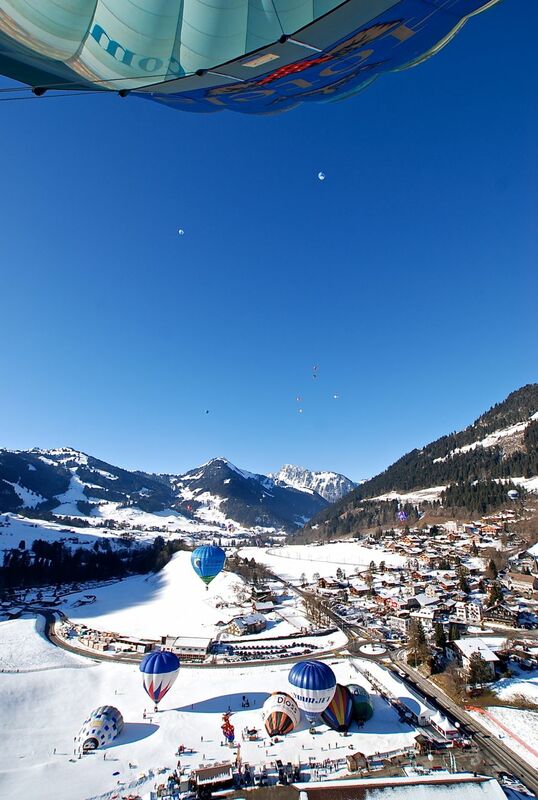 While the balloon flights are open to the public (for 350 Swiss Francs each that is! ), the vast majority of those who visit the festival participate with their feet planted firmly on the ground. Over the two festival weekends in particular, thousands of spectators can be found at the launch site and in the village to witness the spectacle of the colourful and whimsically decorated balloons launching into the air, which also makes the event enormously popular with amateur photographers. 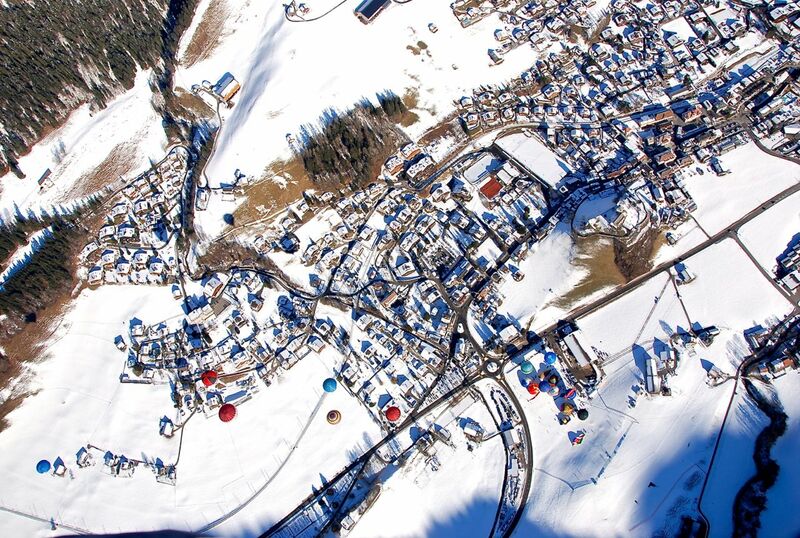 Some balloons fly miles up the valley, while others simply float about town, almost grazing the rooftops of the village hotels and chalets before landing in some nearby cow pasture. Balloon next to us getting fired up. We attended the festival last year and I had a great time taking photographs. I must have taken almost 700! All the time that we were watching, however, there was a part of me that really wanted to experience the thrill of flying in one of those balloons. It was then that I resolved to return in 2014 and do so. January 2014 was a busy month and the festival nearly slipped under my radar before I was reminded by a local news report. A quick check of the weather forecast for the next few days sealed the deal. Tuesday, January 28th was forecast to be a perfect day for flying: blue skies, sunshine and, most importantly, no wind. The chilly -8C temperature didn’t put me off, as I had plenty of warm gear to wear. A two minute call into the festival office and I was booked! No takers in the rest of the family. Just as well considering the cost! I showed up at the festival early on the morning of the 28th. After a short wait, which I spent watching the pilots setting up baskets and balloons and testing their propane burners, myself and 5 other passengers were escorted into the launch area to meet our pilot and balloon. 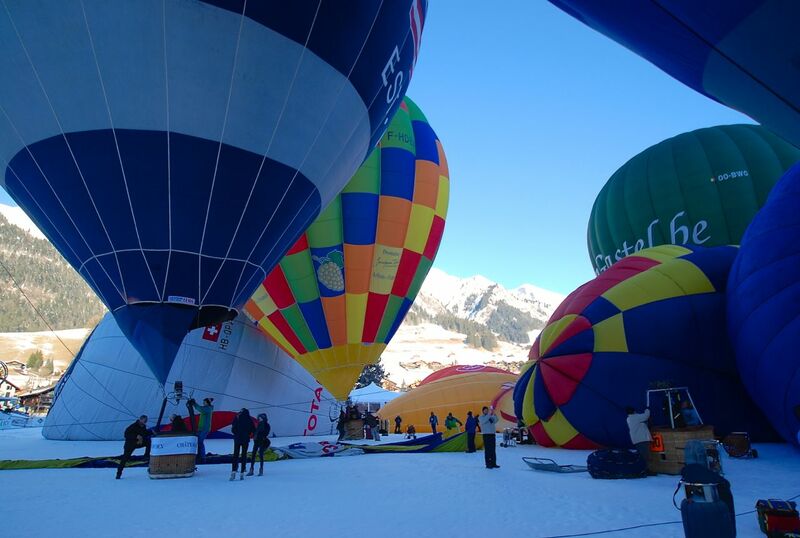 It was fun to walk through the launch zone, dwarfed on all sides by a dozen or so balloons that, once inflated, were each as tall as a 5 or 6 storey apartment building. Mind you, the noise made by the propane burners, as they heated the air inside the fabric balloons (technically called “envelopes”), was loud and intimidating. Heading up and away from the launch zone and Chateau d’Oex. After a passenger safety briefing (e.g. soft knees for take-off and landing; no smoking or dropping things from the basket, etc. ), we piled into our basket and waited with nervous anticipation while our pilot continued heating the air inside our balloon with short blasts from the burner. We joked among ourselves about the cramped conditions in the basket, a bit like standing in a small elevator at capacity. And then we were airborne! Imperceptibly at first, but then more noticeably as we started to accelerate upwards and away from the launch zone. Within a minute or two all the balloons that had towered over us moments before were rapidly shrinking to the size of beachballs. 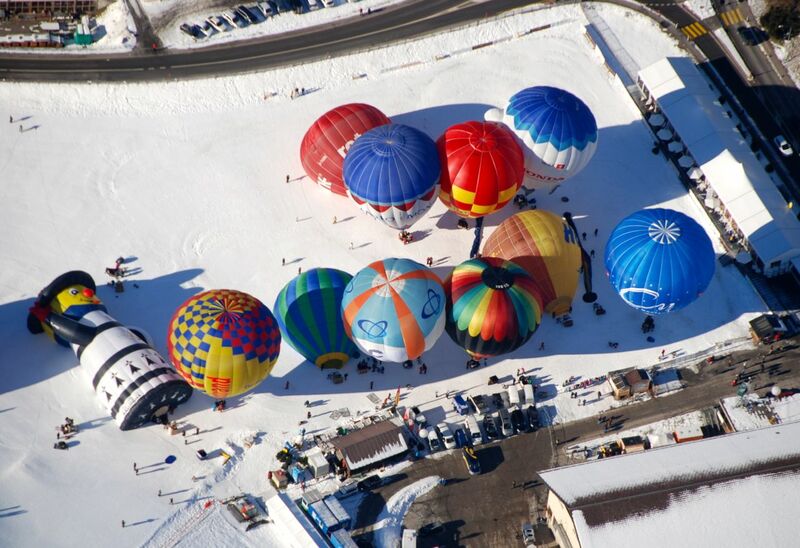 Within another 5 minutes we were thousands of feet up in the air, hovering directly over the launch zone, where the remaining balloons on the ground were reduced to dots of colour against the snow. Looking north towards Rougemont and Gstaad. Once at our maximum altitude of about 10,000ft, we remained relatively stationary over the launch site for a while. Except for the occasional blast from the propane burner and the crackle of voices over our pilot’s radio, it was incredibly peaceful. From our vantage point, the 360 degree view of the Alps was breathtaking. Within a half hour we had been joined by approximately 40 other balloons . Now, you may wonder, as I did, what forces were at work to keep us aloft. 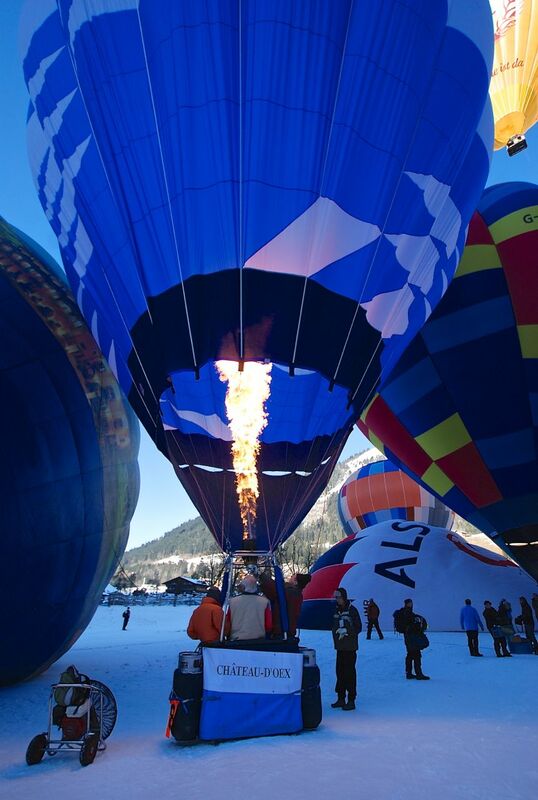 Hot air balloons achieve their lift and buoyancy as a result of the temperature difference between the air on the inside and outside of the fabric of the balloon. Heating the air inside the balloon makes it lighter than the air on the outside, creating buoyant force against the fabric of the balloon. A typical balloon holds about 100,000 cubic feet of air. The amount of lift generated depends on the temperature difference between the two air masses. It is easier, therefore, to generate lift in cold climates versus hot. The air mass within a balloon is heated up to a maximum of about 120 degrees C (250F), well below the melting point for nylon fabric (phew!). In the course of our gradual descent we drifted north of the launch site by a kilometre or so. Once we were within 500ft or so of the ground, however, we began drifting south in the direction of the launch site again. We drifted and eventually passed directly over the launch site, where still more balloons were setting up for launch. We made our final approach for landing in a nearby cow pasture, with our chase vehicle conveniently parked in a lane-way beside the field. As we drifted no more than 100ft from the ground, our pilot expertly navigated us over the top of power lines, railway tracks and chalet rooftops. I could have reached out and touched the roof of the last chalet we passed over before gently landing in the soft snow. We all applauded (and were thankful for) our pilot’s skill. Deflating and packing up the envelope. After jumping out of the basket it was all hands on deck to help prepare the basket and balloon to be packed and loaded back onto the chase vehicle. As the air inside the envelope gradually cooled and escaped, the envelope deflated and began to lean to one side, helped by a couple of passengers pulling on a rope attached to the top. This is so that, once fully deflated, the envelope would lay stretched lengthwise on the ground, for easier packing. Once packed up into its case, and now about the size of a large beanbag chair, the envelope weighed about 150lbs. Then it was a 5 minute drive back to the village. What a magical and unforgettable experience! At 350 Francs, perhaps not one I’ll repeat anytime soon, but still worth it! And if you think I’m crazy, check out what these French balloonists and slackliners are doing. Now THEY are crazy!